How Do You Extend The Life Of Your Wire Mesh Conveyor Belt? Posted June 20, 2014 by Joel Black. When your conveyor belts go out it can be a big deal for business. In fact, it can cause production to come to a halt. This is why it’s very important for you to do what you can in order to prolong the life of your wire mesh conveyor belts. 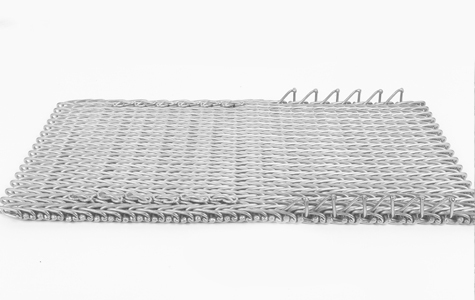 How can I get the most out of my wire mesh conveyor belts? The first thing you need to do is be sure the conveyor belts are installed correctly. The single or the double loop edges of your belt should be curved back, away from the way it will be traveling. The smooth side should always be facing upwards. If your belts are installed incorrectly it can cause accidents and cause a lapse in production time due to the conveyor belts becoming damaged. You also want to watch for contact between the support strips and the z-bends. If the joints located on the underside of your conveyor belt rub or come into any contact with the support strips this can lead to extra wear and fatigue failure. The drive socket teeth of the conveyor belts need to be aligned perfectly. This way, they will all be pulling together smoothly. If they don’t pull smoothly then this can cause certain wire strands to experience stress overload. The transfer or reverse bend ratii being too small can cause added stress to the z-bends. This will cause the z-bend joints to end up creating their own groove into the transfer support. What kind of routine maintenance should I be doing on my wire mesh conveyor belts? One of the things you want to keep an eye on is the drive components. Be sure to change theses if they become worn or damaged. Worn drive sprockets or idler sprockets can cause your conveyor belts to skip or drift from one side to the other. This will lead to premature wear of the conveyor belts. You also want to look for any improper clearance between the z-bends and drive sprockets. The z-bends cannot make any contact with any other component. You should maintain a minimum of 3/16” to 1/4” clearance. Make sure there is never too much tension on the conveyor belts. Having too much tension can cause the wires to pull apart which will cause the belts to fail. By properly installing your wire mesh conveyor belts and performing a routine check on them you can extend the life of them. This is very important when your business depends on good productivity. If you experience a failure in this equipment it can cost you time and money, which no business wants to experience.